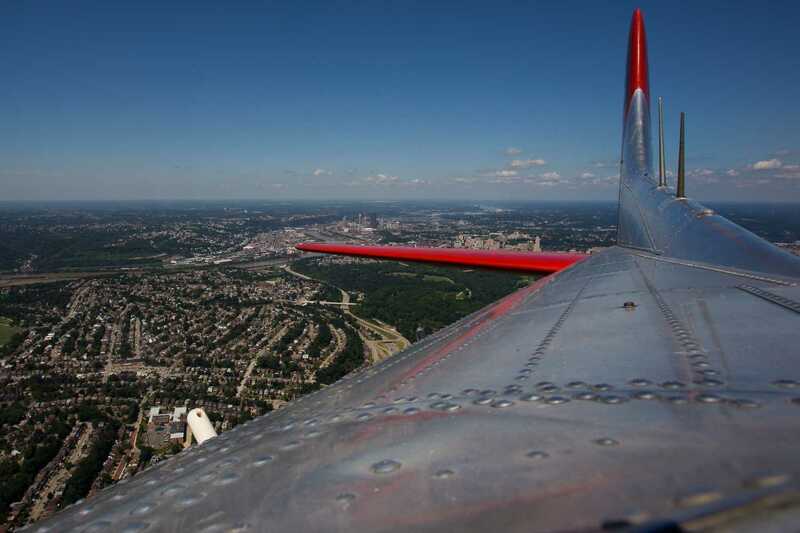 Listening to the sound of four revving engines muffled by ear plugs, passengers on the B-17 crawl into the nose turret of the WWII-era bomber, seeing stretches of land and Pittsburgh landmarks appear and disappear before them. The Liberty Foundation — a nonprofit group based in Oklahoma — is offering flights on a B-17 bomber to preserve aviation history, honor veterans and educate the public on WWII. Flights on the Flying Fortress — dubbed “Madras Maiden” — will be offered to the public from 10 a.m. to 5 p.m. Aug. 5-6 at the Allegheny County Airport. The Madras Maiden is one of about six B-17s still in operation after more than 12,000 were produced for WWII. The half-hour scenic tour of the city is $410 for Liberty Foundation members and $450 for non-members. And for those that want to simply view the plane, ground tours will begin in the afternoon and are free, although the Liberty Foundation suggests a donation to help them offset the cost of keeping the living museum running. The B-17 embarked on a media flight Monday morning, giving The Pitt News and other media organizations a chance to see and feel the historic plane in action.